As in the previous two years, I took advantage of my final spring student tour group ending in a major airport hub (PHL), to seek out a cheap flight to somewhere new to explore – giving myself a little break at the end of very busy stretch of work tours. 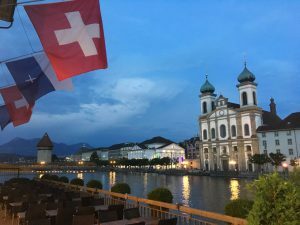 This year I found a $450 round trip to Zurich, Switzerland, and thus I went, arriving in the AM May 27th. 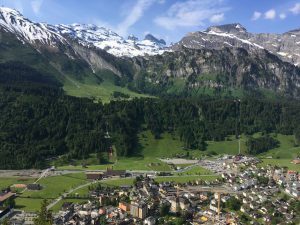 The goal of this trip was primarily hiking in the Alps, and fortunately Switzerland has frequent and efficient public transport (train and bus) to get from the cities to the smaller alpine gateway towns. After making stops in Zurich and Berne to walk around for several hours, I made it to Interlaken in time to also check it out. But my main target was Lauterbrunnen, where I went the next day by train. I’d heard of this valley before, how glaciers left behind cliff walls with numerous waterfalls cascading down into the villages and fields of bell-clanking cows. 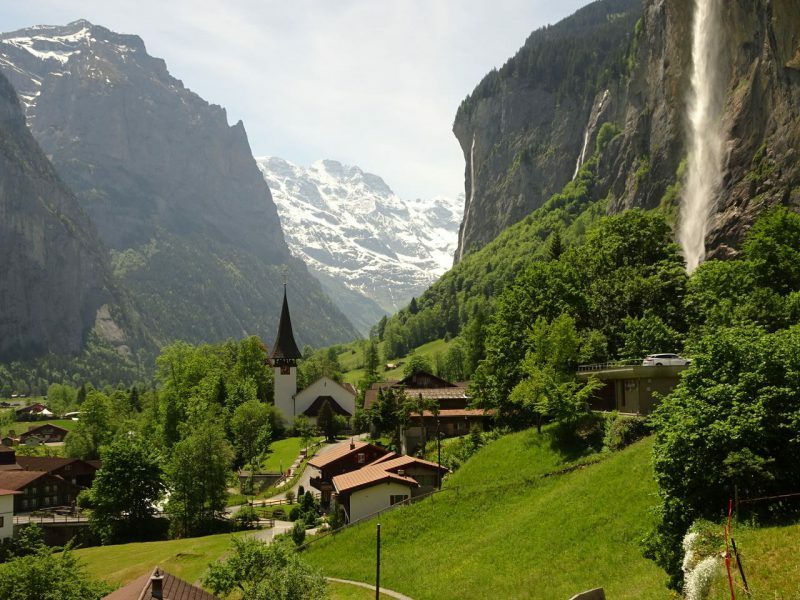 Stepping out of the train station, I was immediately impressed by the setting, and upon checking in to my hostel, set off on walking up the valley floor, passing several tall waterfalls and looping up above to cliff walls through Gimmelwald and Murren. This is a great hike and I highly recommend doing it starting by noon, as there’s a big difference in scenery when the sun shines bright on the white waterfalls on the east-facing cliffs. By mid-afternoon, they are in the shadows. Trek day 1: Left Lauterbrunnen at sunrise, and hiked up to Wengen and on up to Kleine Scheidegg pass. Rain was forecasted for today, but all I saw above me was blue sky, and the massive rock faces of Eiger, Monch, and Jungfrau. 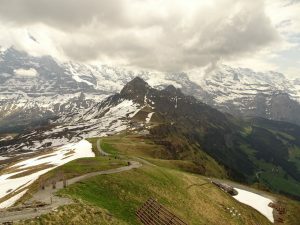 From the pass, I could see that the trail would descend a more sheltered route into Grindelwald, but I wanted to stay higher for the open views, so wrapped around a trail that was actually closed due the snow that still draped it in stretches, up to Manlichen’s peak and overlook, and then descended to Grindelwald from there. I stayed at Hotel Alpenbick (in their basement dorm) and ate a big dinner. I had dressed light, expecting wet weather, but instead got a big sunburn. It was around a 22 mile day. Trek day 2: One thing I was learning about the trails in Switzerland, is there are MANY and well marked for the most part, directing you from village to village. The Via Alpina is not the only trail, and it is constantly being transected by other worthy trails. So leaving Grindelwald, I decided not to follow the Via Alpina’s gradual ascent up the pass, flanking a paved road, but promptly ascended steeply up to Bort and Schreckfeld to immediately be rewarded with open views over the valley with the snowcaps in the background. From there I could follow a route that stayed fairly level along the mountainside to the pass at Grosse Scheidegg. Like the day before, looking down from the pass toward the next valley, I preferred to take the route less traveled flanking the open mountainsides, then down into the valley rather descending directly by the road and shelter of trees. This was a good call, except that in the process of washing my lunch nectarines from my fingers in a stream, I dropped my camera in water. I dried it off as best I could, but it ceased to work, and the rest of my trip would have to documented with my iPhone. My chosen trail did descend back into the valley, rejoining the main route, and even though it had more tree canopy and roadway development, the views were great and the towering peaks seemed omnipresent. 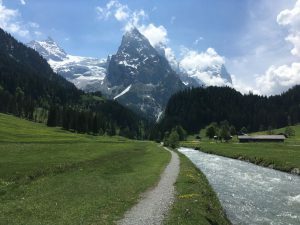 I passed through the main valley hub of Meiringen, and hiked up to the village of Hasliberg-Reuti where I stayed in Pension Alpenbick, where I was the only guest. It was an 18 mile day. Trek Day 3: By this point I was feeling confident that warnings about the higher elevation trails not being passable in the early season were over-cautious protocols. After all, we’d had 3 straight days of temps in the 80’s. But on this day, when I hiked the long steep route up to Planpatten and saw snow drifts that still blanketed the narrow ridge lines that I was supposed to cross, and clouds seemed to linger on that side of the valley obscuring both sun and visibility, I realized the warnings were legit and I was worried for the first time. Since clouds and views over the hill and beyond the bend prevented me from being able to tell just how covered the trail was, I decided to just proceed, telling myself I’d turn around if encountered anything that I considered life threatening. I grabbed a large wooden stake (pole) to help me keep my footing and balance when I had to cross sloped drifts. Fortunately, it had been warm enough that the snow was fairly melted such that I could create my own footholds by just firmly planting my feet with each step. If it were ice, it would have sent me for a ride. So once I accepted the consequence of wet feet in my tattered running shoes, it wasn’t as bad as it looked. I passed several chair lifts that were shuttered for the season, and only saw other people in the little hamlets at Tannalp and Engstlenalp. I was the only hiker, and by the infrequency of other footprints in the snow, I had probably been the only hiker for some time. When I crossed over Jochpass, the snow was at its worse, but ironically at its easiest. It no longer made sense to even try and follow a trail when the whole slope seemed to be white. I saw that if I just stayed close to the ski lift lines, I’d get to where I needed to be, so I implemented a kind of combination of downhill hiking and sliding and promptly got to where the snow petered out, and I could resume on marked paths. However, at Trubsee, the steep trail down to Engleberg was closed. I was forced to take gondola (the first working one I’d seen all day) down. I did not complain. It had been a long, precarious day. Though a shorter 15 miles, compared to the previous days, this one felt longer. Trek Day 4: Due to the nature of the previous day, I decided to alter my hiking plans and forgo my intended last leg of the Via Alpina, as it would be passing another high pass of unknown condition. So I slept in a bit, enjoyed a nice breakfast at my Engleberg Trail Hostel, and mapped out an alternate route. 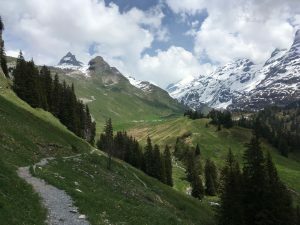 I hiked up to Ristis, Brunnihutte, and the panorama at Rosenbold, and wrapped around the mountain side, without having to navigate snow or high passes down into Wolfencheissen. While that ended my alpine trek with a more leisurely 10 miles, I promptly caught a train to Luzern where my walking was not finished. I retired my old trail shoes in a park, and took a nice chilly swim in Lake Luzern, checked into my Backpackers hostel, cleaned up, then went about exploring the town, spending my last Swiss Franks on a donner box, and grocery store bread, cheese and beer to be consumed on the promenade banks of the river while the city transition to night. The next day, June 3, was all about travel. I took an early morning train to Zurich, and another to the airport. I flew to ATL passing the 9 hours watching four forgettable movies. I retrieved my car that I parked in hotel parking, grabbed a quick dinner with cousin Jeremy, and then drove on to Asheville to happily see my awaiting fiancée Kim and pooch El Guapo. In summary, this was a great little week-long escape into stunning nature. The Swiss Alps are deserved of their beautiful reputation. The Via Alpina is not like a US long distance trail that takes you away from human activity for days on end, but rather links you to numerous villages that dot the valleys and mountain sides, and connects to many gondolas and lifts to ease your journey if you are so inclined. For the most part, I would say that the human activity and amenities do not detract from the stunning nature around you, but add to it with charm. I particularly enjoyed that these amenities of public transport, frequent food and lodging meant that I could make such a trip, traveling light with a relatively small carry-on backpack, meeting my needs along the way. If you come before mid-June, the trail conditions in the passes over 2,000 meters might be sloshy, but there are plenteous simpler trails to explore at lower elevations (however those may not lead you to the “next valley” if you are planning a point to point thru hike). I had reserved each of the places I stayed in, so I was sort of locked into a route. While I probably could have just shown up without reservations or a set plan to some places as it was still early in the summer season, I get the impression it would be challenging to trek the Via Alpina relying solely on serendipity. Places may fill up, or you will end up staying at a much more expensive place than you wanted. 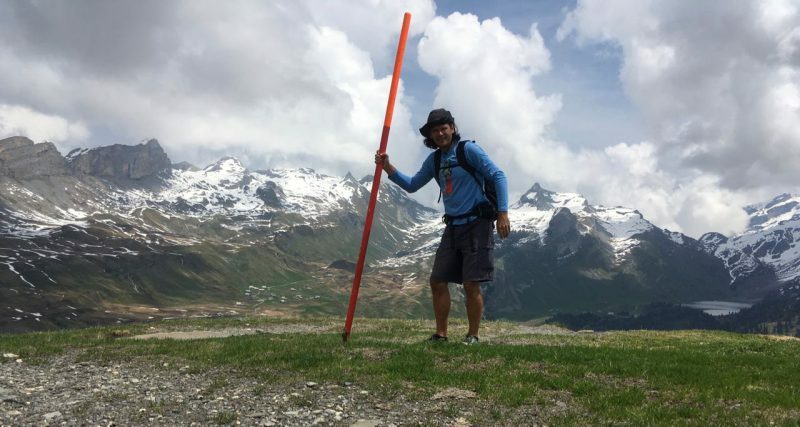 Switzerland is already very expensive for transport, restaurants, and lodging, such that I would be hesitant to do a prolonged, meandering trek. The more frugal way to do it would be to carry camping gear, and you can eat pretty well from the grocery markets in the hub villages; however, the terrain forces you into some grueling steep ascents and descents, and I was so glad I was only carrying my small, lighter pack. Pros and Cons. In any event, make sure you get out of the villages, charming as they are, and away from the busloads of Asian tourists, and put your feet upon the vast network of walking trails in Switzerland. It so often feels like walking through a movie or a painting, idyllic and all around you.